Modular LED displays allow brands to create a real ‘destination’ where consumers genuinely want to go and discover brands and what they have to offer. Cutting edge LED displays are visually appealing and drive intrigue and a desire to explore the experience within. The dynamic nature of the display means they can be easily changed to ensure the experience doesn’t tire. We designed this pop up modular bar for Guinness. The eye-catching and interactive exterior lures passing consumers into wanting to peek and find out more inside. LED tiles create a terrific digital canvas that is truly unique and eye-catching, enticing passing customers to enter and discover more. The innovative, compact, modular displays can be configured into any shape or size – the tiles simply snap together and auto calibrate. The tiles cater for both static and moving content. The technology can also be enhanced to increase customer engagement through interactive touch screen capabilities. 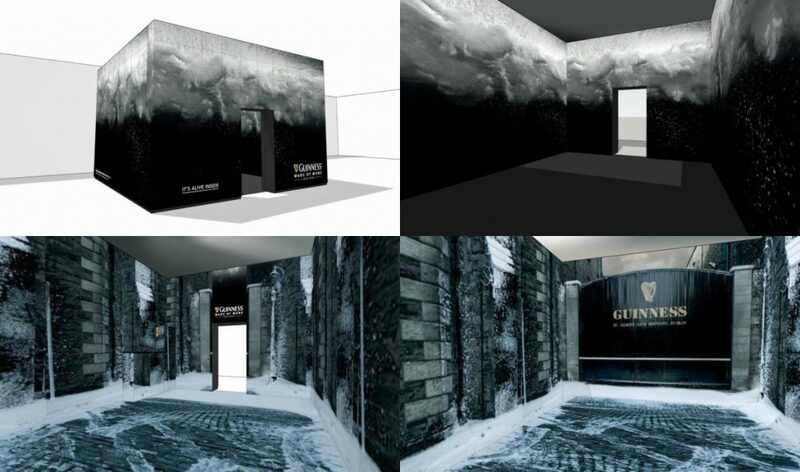 The ability to adapt display solutions so easily, whether it’s to accommodate the demands of a challenging environment, or to repurpose the display for a new brand, project or season, enables brands to constantly be at the forefront of their industry through the latest digital creativity and consumer engagement. These displays can also be interactive using touch-screen technologies. Finger-based gestures such as flicking, pinching, rotating and scrolling of content allowing users to interact directly with the display.